Monday 15th August 2016 – 4.40pm – Murray MacGregor. 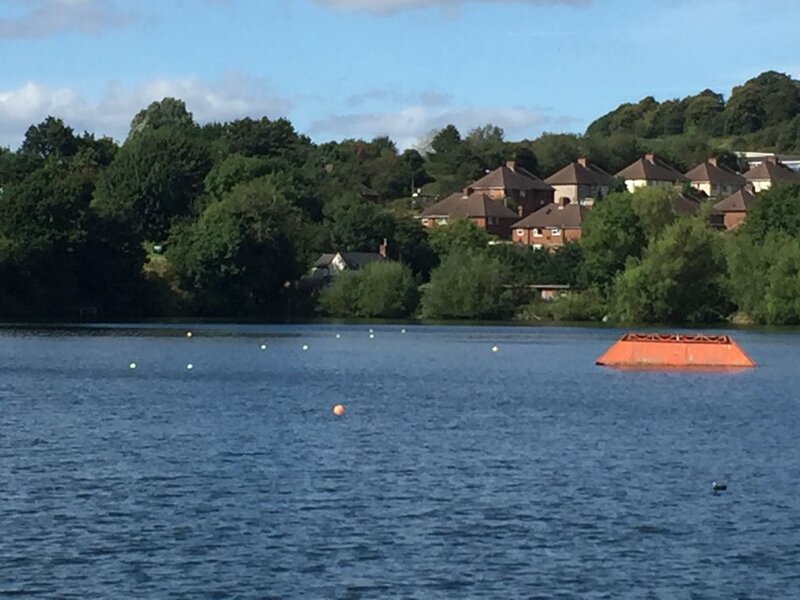 A teenage girl who injured her back when she landed badly whilst water skiing, has been treated by ambulance staff. It happened at the Dudley Watersports Centre in Highbridge Road, Netherton at about 3.00pm this afternoon, Wednesday. A rapid response vehicle, an ambulance and a paramedic officer from the Hazardous Area Response Team were sent to the scene along with firefighters. A West Midlands Ambulance Service spokesman said: “On arrival, ambulance staff were told that the 14 year old girl had fallen face first. “The Watersports Centre’s own rescue staff had done a superb job looking after the girl and bringing her to the waters edge. “There she was immobilised before being lifted out of the water and taken to the ambulance for an assessment. “She was complaining of back pain so was given pain relief before being taken to Russells Hall Hospital. Wednesday 31st August 2016 – 9.20am – Murray MacGregor. A two car crash at a junction led to a camper van striking the wall of a house. A rapid response vehicle, two ambulances, a paramedic area support officer, a BASICS Emergency Doctor and the Midlands Air Ambulance from Staffordshire were sent to the scene. A West Midlands Ambulance Service spokesman said: “When crews arrived they found a blue car with significant front end damage. A white and orange campervan had left the road and come to rest against the side of a house; there was also debris in the road. “There were four patients in total; the two more serious were from the camper van. “The front seat passenger, a woman in her 30s was initially reported to be semi-conscious, but came round as ambulance staff treated her. She was airlifted to Royal Stoke University Hospital with a possible head injury. “The driver, a man was taken to the same hospital with neck and abdominal pain. Both were immobilised before being taken to hospital. Tuesday 30th August 2016 – 5.18pm – Murray MacGregor. 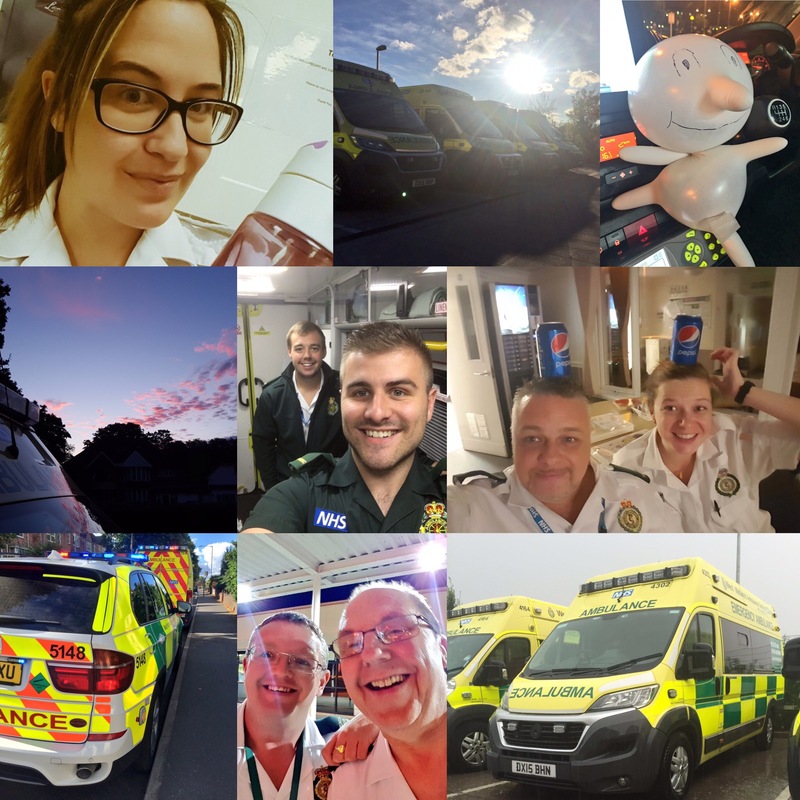 While millions of us enjoyed a bit of late summer sun (and some rain) over the August Bank Holiday weekend, hundreds of ambulance staff were busy saving lives and providing care to people in their hour of need. 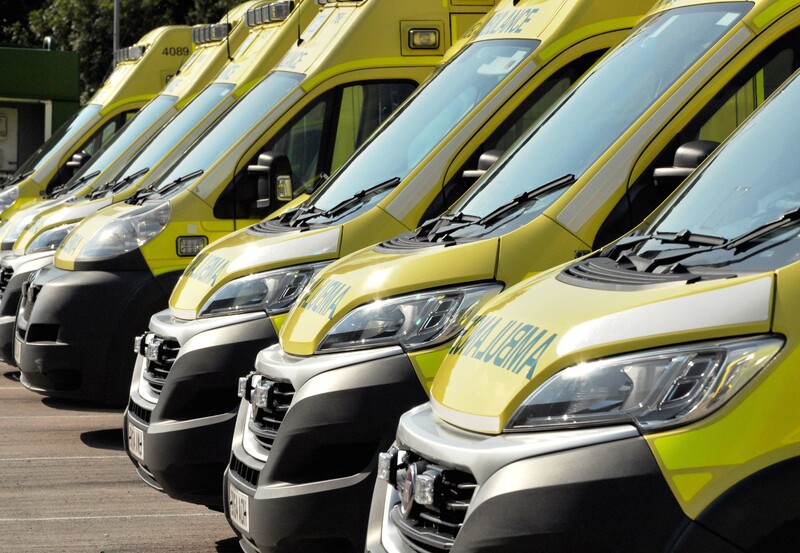 Over the four days, Friday 26th – Monday 29th, West Midlands Ambulance Service received no fewer than 11,639 999 emergency calls, just under 5% more calls (+ 547 calls) than the same August Bank Holiday in 2015. The biggest increases came in Staffordshire (+8.0% to 2224 calls), Birmingham (+7.5% to 2925 calls) and Worcestershire (+6.9% to 995 calls). Shropshire bucked the trend with a slight fall in call numbers, down 1.4% to 704 calls. However, within the headline figures there were some extremes, partly due to the weather. For example, yesterday (Monday), Herefordshire had a 35.6% increase on the Bank Holiday Monday in 2015. On Friday, Black Country saw a 14.3% rise compare to the previous years Friday. Emergency Services Director, Craig Cooke, said: “I would like to thank all of our staff and volunteers who worked so hard over the Bank Holiday weekend. When many of us were enjoying time with friends, family and enjoying a few days off, our staff were working day and night to ensure people had the highest levels of clinical care when they needed it most. “Given the expectation of high demand, we planned well and that ensured we were able to deal with patients in a timely manner. I would like to particularly thank the many staff who were prepared to work additional shifts to ensure we had the cover we needed to provide such a high level of service to the people of the West Midlands. Tuesday 30th August 2016 – 10.50am – Jamie Arrowsmith. A motorcyclist has died after colliding with a barrier in Rubery yesterday afternoon (Monday). West Midlands Ambulance Service was called to Redhill Lane at 2.25pm and sent two ambulances and a paramedic area support officer to the scene. A West Midlands Ambulance Service spokesman said: “On arrival at the scene, crews were told that the man, who had come to rest on the central reservation, had initially collided with a barrier. “One of the Trust’s Patient Transport vehicles had already stopped to offer assistance and together with bystanders were administering CPR on the man. Friday 26th August 2016 – 4.45pm – Jamie Arrowsmith. An elderly woman has suffered a serious leg injury following a collision with a 4×4 vehicle this afternoon. West Midlands Ambulance Service was called to Alcester Road South in Brandwood, Birmingham at 2.55pm and sent an ambulance, a paramedic area support officer, a rapid response paramedic and the Midlands Air Ambulance from Cosford to the scene. A West Midlands Ambulance Service spokesman said: “On arrival crews discovered a patient who was partly trapped underneath the vehicle. “The woman, who is thought to be in her 80s, was conscious and had to be freed with the help of the fire service. “Ambulance staff assessed her and administered emergency treatment for a serious left leg injury. “The doctor from the air ambulance, which had landed in a nearby cricket club, administered pain relief before travelling with the patient on a land ambulance in order to continue treatment en-route to Queen Elizabeth Hospital, Birmingham. Friday 26th August 2016 – 3pm – Jamie Arrowsmith. Thankfully the only serious damage suffered was to the cars when a collision on the M6 this morning saw one overturn and leave the carriageway whilst the second mounted a roadside barrier. West Midlands Ambulance Service was called to the northbound carriageway of the M6, between junctions 14 and 15, shortly before 11.10am and sent two ambulances, a paramedic area support officer and a rapid response paramedic to the scene. A West Midlands Ambulance Service spokesman said: “Crews arrived to find two cars that had suffered significant damage and four patients in total. “One of the cars had come to rest on its roof after leaving the carriageway from which there were three patients, all men who are thought to be in their late teens. “Incredibly, two of them escaped uninjured whilst the driver was treated for minor injuries and transported to Royal Stoke University Hospital as a precaution. “There was one occupant in the second car, a woman who is also thought to be in her late teens. “She too avoided serious injury but was treated for neck pain before being taken to the same hospital. Thursday 25th August 2016 – 10.30am – Claire Brown. A motorcyclist, whose helmet ended up 50 metres down the road following a collision with a car, has been taken to a major trauma centre this morning. The incident happened on Saltwells Road, Netherton shortly after 7.30am (Thursday). Two ambulances, a paramedic area support officer and a senior paramedic officer attended the scene together with police and fire colleagues. A West Midlands Ambulance Service spokeswoman said: “When crews arrived they found a motorcyclist who had come off his bike after a collision with a car; the biker’s helmet had come off in the collision and was found 50 metres down the road. “The biker, a 21-year-old man, was assessed by ambulance staff who found he had sustained multiple serious injuries with several fractures as well as numerous abrasions. He was given pain relief and oxygen to help stabilise his condition whilst his injuries were carefully immobilised. 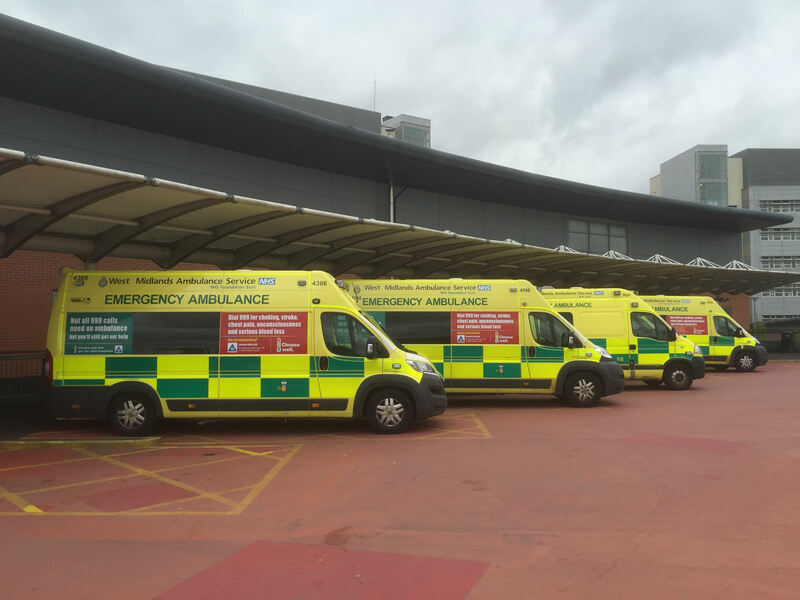 The man was then taken by land ambulance on blue lights to Queen Elizabeth Hospital Birmingham, a major trauma centre, for further specialist treatment. Wednesday 24th August 2016 – 2.20pm – Jamie Arrowsmith. A motorcyclist has been treated for multiple fractures and alerted in to one of the region’s major trauma centres following a collision with a road sweeper this morning. West Midlands Ambulance Service was called to Cateswell Road in Sparkhill, Birmingham shortly after 11.50am and sent an ambulance and a paramedic area support officer to the scene. The Warwickshire and Northamptonshire Air Ambulance, with a doctor on board, was also in attendance. A West Midlands Ambulance Service spokesman said: “Crews arrived to find a man on the floor after falling from his bike when in collision with the road sweeper. “The man, who is believed to be 30-years-old, was suffering from a reduced level of consciousness and had suffered a number of serious injuries. “Once staff had stabilised his condition he was treated for leg and arm fractures as well as head and shoulder injuries. “He was then transported to Queen Elizabeth Hospital, Birmingham on blue lights and sirens with the doctor from the air ambulance also travelling to continue treatment en-route. Wednesday 24th August 2016 – 11am – Jamie Arrowsmith. For those heading southbound on the M6 this morning, a collision involving two vans and a car may well be the reason you found yourself sitting in traffic near to junction 3A. West Midlands Ambulance Service received a 999 call at 7.09am to reports of a three-vehicle collision and sent one ambulance and a paramedic officer to the scene. A West Midlands Ambulance Service spokesman said: “On arrival, crews discovered two vans and a car that had been involved in a collision. “Thankfully there was only patient, a man driving the car, and despite the significant damage he had luckily escaped serious injury. “The man, believed to be in his 40s, was treated for minor back and neck pain by ambulance staff before being transported to University Hospital Coventry and Warwickshire for further assessment. Tuesday 23rd August 2016 – 3.30pm – Claire Brown. Two air ambulances were sent to the scene of a RTC this morning which left a man and a woman seriously injured in Tamworth. The incident happened on Bonehill Road in Tamworth at around 11.15am (Tuesday). Two ambulances, a paramedic area support officer, the Midlands Air Ambulance from Tatenhill and the Warwickshire and Northamptonshire Air Ambulance with a doctor on board were sent to the scene. A West Midlands Ambulance Service spokeswoman said: “The two car RTC had left the driver and passenger in one car trapped. The driver, a man in his 60s, had sustained multiple serious injuries. Ambulance staff and the doctor administered advanced pain relief and provided trauma care to the man whilst the fire service carefully worked to release him from the wreckage. 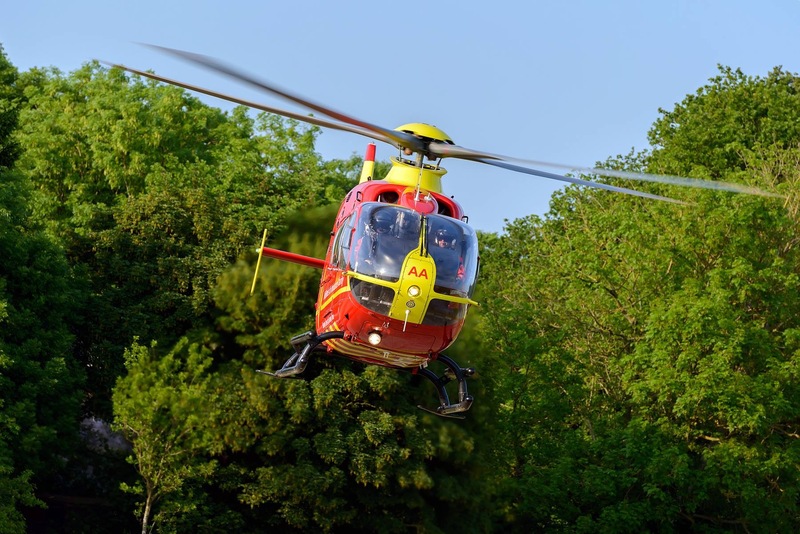 “Once out of the vehicle, the man was fully immobilised before being carried to the awaiting air ambulance, which had landed in a nearby field, which flew him to University Hospital Coventry and Warwickshire. “The woman passenger, also in her 60s, had numerous fractures and also required advanced pain relief from ambulance staff whilst they tended to her injuries. Once the fire service had extricated her from the car, she too was fully immobilised and airlifted to the same hospital. Monday 22nd August 2016 – 4.00pm – Claire Brown. An elderly man is fighting for his life following a two car collision in Warwickshire this afternoon. West Midlands Ambulance Service was called to Greenhill Street in Stratford-upon-Avon shortly after 1.30pm (Monday). Two ambulances, a paramedic area support officer, the Midlands Air Ambulance from Strensham with a doctor on board and a second helicopter from Warwickshire and Northamptonshire Air Ambulance (WNAA) with a doctor on board attended the scene. A West Midlands Ambulance Service spokeswoman said: “The paramedic area support officer was first on scene and arrived to find a man, the driver of one car, in cardiac arrest. A police officer and GPs from a nearby surgery were already performing excellent CPR on the man and were using a public access defibrillator. “The paramedic took over resuscitation efforts and was assisted by a passing off duty paramedic who stopped to help. Once joined by ambulance colleagues, the team continued advanced life support at the roadside and managed to gain some cardiac output. Despite this, the man was still critical and was quickly airlifted to University Hospital Coventry and Warwickshire by WNAA with a doctor on board. Upon arrival in A&E the man was said to be in a critical condition. “A woman from the same car sustained chest pain and was treated on scene before being taken to Warwick Hospital. In the second car were two women; a mother and daughter. The driver suffered a suspected fractured wrist whilst the passenger had cuts and bruises. Both were treated by ambulance staff before both were taken to hospital in the same ambulance. “It is always a welcomed sight for ambulance staff to see a patient in cardiac arrest receiving CPR. A special thanks to the GPs from Rotherhouse surgery, the police officer and our off duty staff member for their assistance on scene. Monday 22nd August 2016 – 11.07am – Murray MacGregor. A man’s been airlifted to a major trauma centre after his car hit a tree side on causing significant damage. It happened on the A429 about a mile south of Wellesbourne towards Ettington in South Warwickshire. An ambulance was on scene within seven minutes and was backed up by a paramedic area support officer and the Warwickshire and Northamptonshire Air Ambulance after four 999 calls at 7.23am this morning (Monday). A West Midlands Ambulance Service spokesman said: “When crews arrived they found the blue Mitsubishi side on against a tree. There was significant damage on the driver’s side. “Due to his injuries, ambulance staff removed the man from the vehicle rapidly and stabilised his condition. “He was suffering from fractured ribs, chest and possibly pelvic injuries. Monday 22nd August 2016 – 9.45am – Claire Brown. As festival goers start to pack up their tents at Weston Park this morning, our on-site medical provision begins to wind down from another busy V Festival. Since the gates opened on Friday, West Midlands Ambulance Service has been on-site to provide medical cover in partnership with St. John Ambulance. The provision included a medical centre staffed by doctors and nurses, as well as a command and control centre which co-ordinated the responses of ambulances and other medical staff stationed across the site to patients in need of medical assistance. A total of 1,218 patients have been treated, a slight increase from last year, with 40 patients requiring onward transportation by ambulance to hospital. The wet weather didn’t let up much throughout the weekend for revellers and consequently played a part with many injuring themselves after slips, trips and falls. A number of patients were also treated for the effects of too much alcohol and people with a flare up of pre-existing medical conditions were also seen. Steve Wheaton, Assistant Chief Ambulance Officer, said: “With tens of thousands of people all in one place, we’re always prepared for the unexpected as it’s inevitable that people will fall ill and require our help. The team of staff and volunteers have worked extremely hard to ensure every patient received the very best care. A special thank you to the day staff that remained onsite after their shift had ended last night to lend an extra pair of hands during a particularly busy period in the medical centre. Sunday 21st August 2016 – 7.13am – Murray MacGregor. 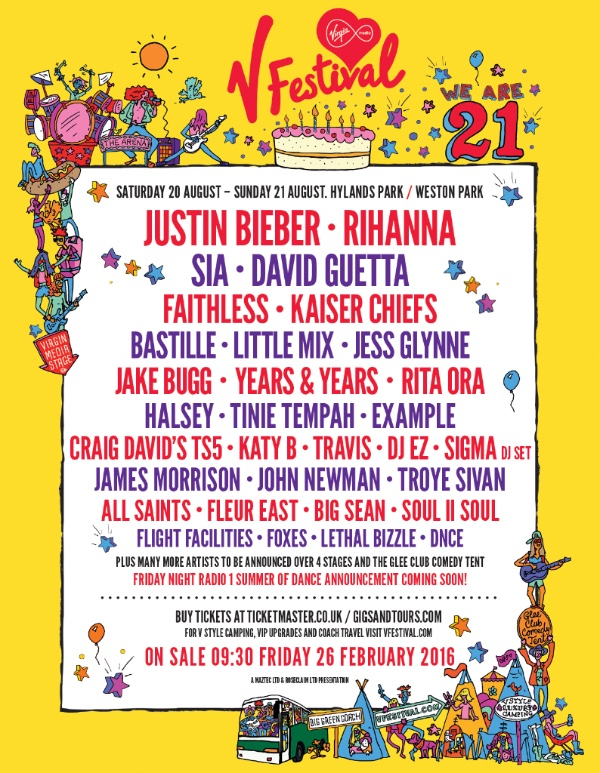 Despite the weather, the numbers requiring medical attention at this year’s V Festival at Weston Park have risen only slightly and those needing hospital treatment has actually fallen. West Midlands Ambulance Service is providing medical cover in partnership with St. John Ambulance. As in previous year there is a medical centre at the festival. Since the gates opened, 681 patients have been treated, yet only 11 have required onward transportation to hospital. As you would expect, injuries from slips trips and falls have featured heavily, but other reasons for accessing medical help have been on-going conditions, and injuries sustained as a result of having drunk too much alcohol. With the weather looking set to be sunny for much of the day before the chance of more rain this evening, we would urge those heading to Weston Park today to be prepared for all conditions. Saturday 20th August 2015 – 6.55am – Murray MacGregor. West Midlands Ambulance Service in partnership with St. John Ambulance is providing medical cover at this year’s V Festival at Weston Park. “So far, 230 people have been treated at the on-site medical centre collectively by St. John Ambulance volunteers and West Midlands Ambulance Service staff after self-presenting to the facility. On-site ambulance crews around Weston Park tended to a further 40 patients with 11 patients requiring hospital treatment. These were mainly people with existing medical conditions, though a couple had sustained fractures after falls. “The vast majority of cases were minor injuries as a result of people being intoxicated. “With the weather forecast looking potentially quite stormy, we would ask people to be prepared. If you’re heading to the festival it’s really important that you don’t forget some waterproofs and some wellies as it is likely to become muddy and slippery underfoot. Thursday 18th August 2016 – 3.15pm – Murray MacGregor. One half of a duo of paramedics who have almost 90 years of service has retired. 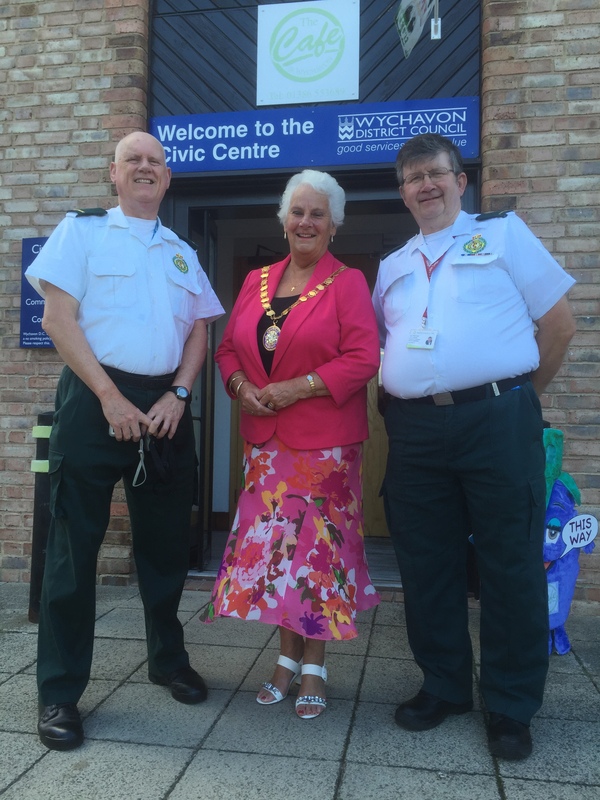 It comes only a fortnight after the pair were given a civic award by the Chair of Wychavon District Council. 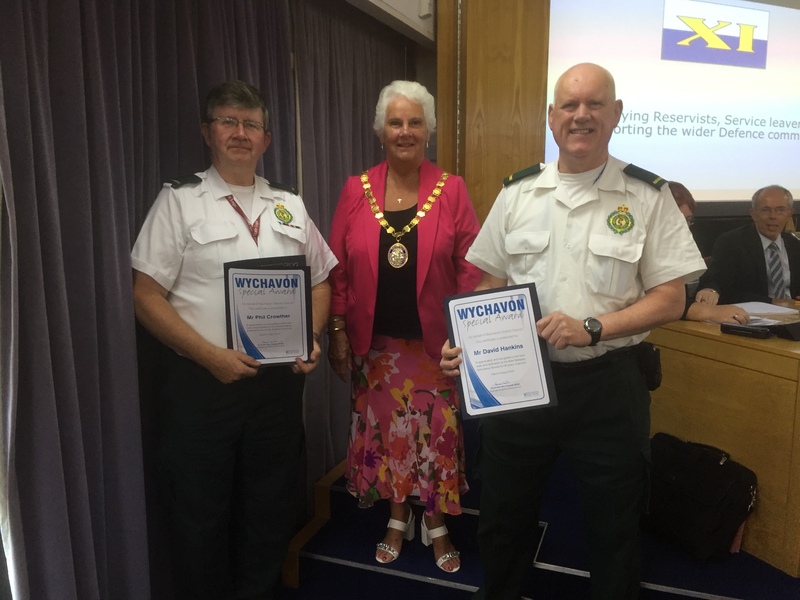 Paramedics Dave Hankins and Phil Crowther were presented with certificates by Councillor Frances Smith at a meeting of the full council. 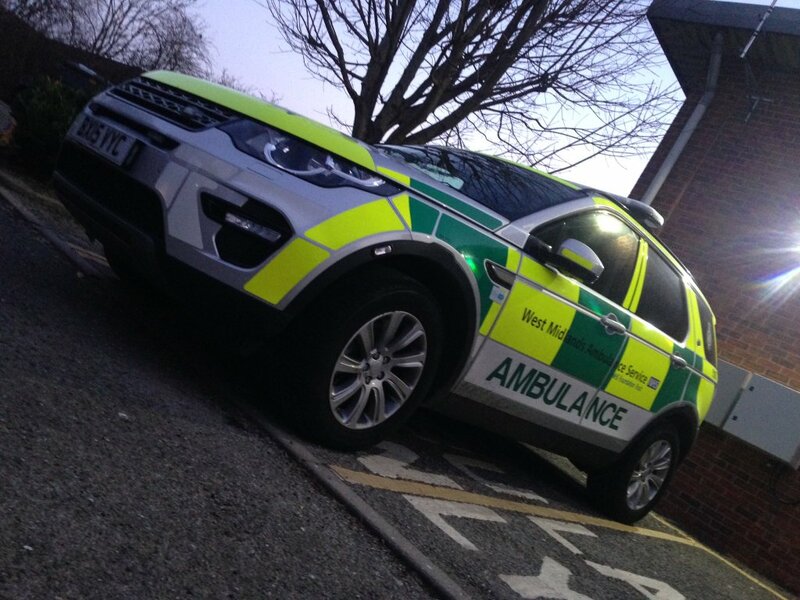 The pair worked on a rapid response vehicle based at Evesham. 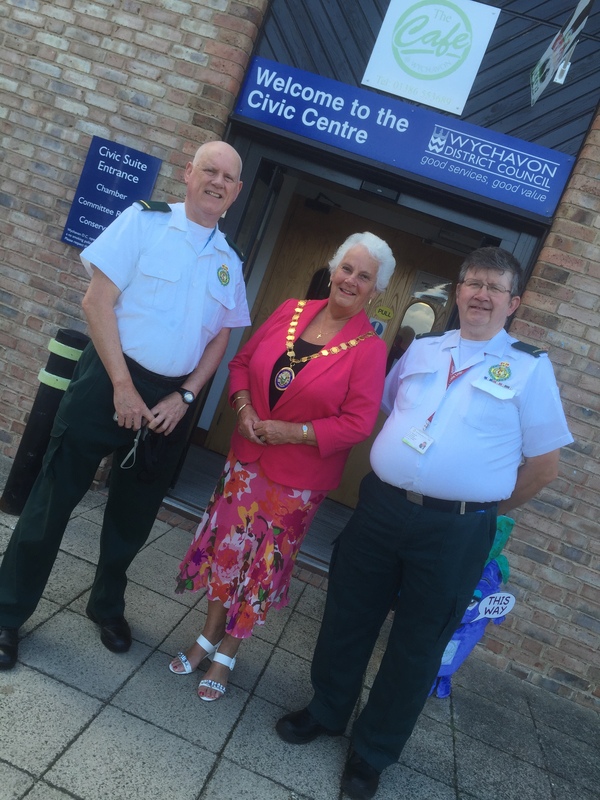 Dave started with Worcester City and District Voluntary Ambulance Service in July 1969 while Phil is a comparative spring chick having started in London in 1975 before moving to Worcestershire in 1979. But now Phil has hung his radio up for the very last time after 41 years of work with the ambulance service. The pair were honoured by the Council after Councillor Smith saw them receive long service awards at the Trusts Annual Awards Ceremony. 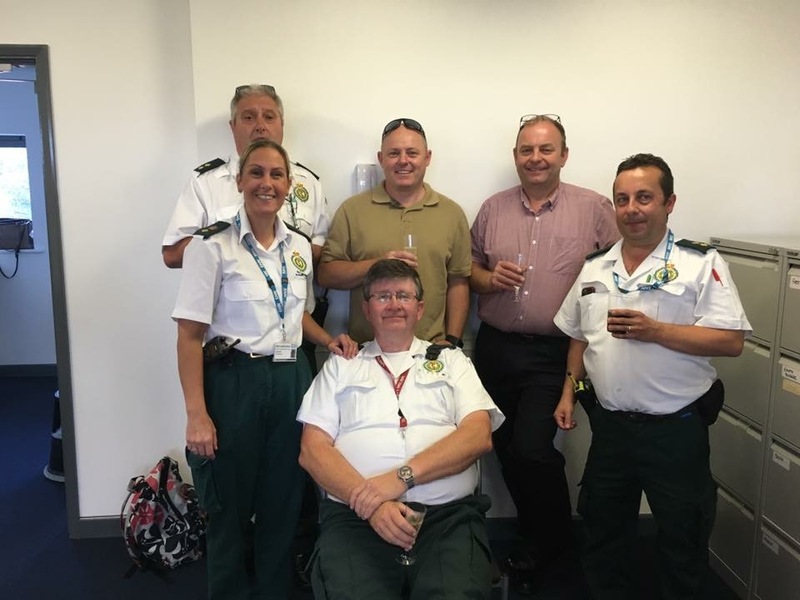 As well as being a dedicated paramedic, Phil was a stalwart of the Staff Advice and Liaison Scheme (SALS), which supports ambulance staff who have had to deal with particularly traumatic cases. A large group of staff, past and present joined him last night in Evesham for an appropriate send off. Phil said: “I have had a fantastic career. In particular, I am immensely proud that I helped to train no fewer than 120 paramedics when I worked in the Training Department. While Phil will be taking life a little easier from now on, it seemed appropriate that he handed over the keys of the response car to Dave last night. Dave says he has no plans to take life a little easier any time soon. He said: “I am immensely proud to work for West Midlands Ambulance Service. The way we treat patients has moved forward so much since I started. Wednesday, 17th August – 2.45pm – Jamie Arrowsmith. The annual pilgrimage of music lovers heading to Weston Park for V Festival will soon be underway again and as such, final medical preparations are being made. Huge numbers are expected to attend the popular annual festival with a large number of day visitors swelling the crowd this year. 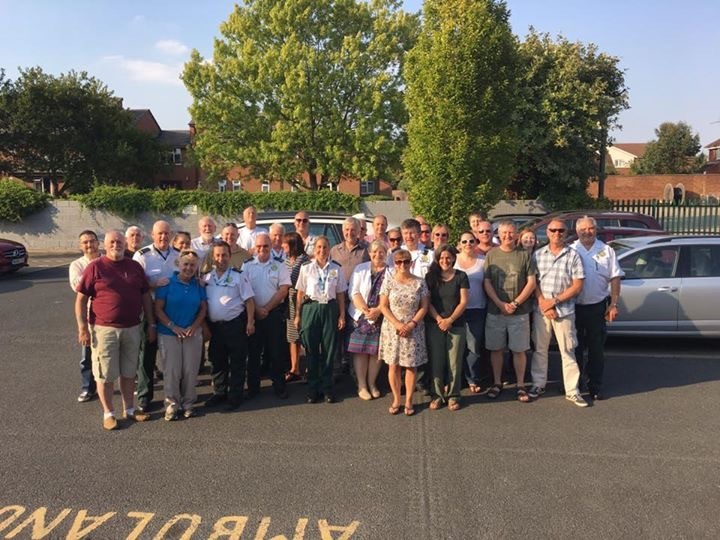 West Midlands Ambulance Service (WMAS) will work with St. John Ambulance Service to ensure first-class medical services are available in order to make it one of the safest festivals in the country. Last year, just over 1,000 patients were treated for a variety of injuries, 36 of whom required transporting to hospital. Early indications suggest the weather will be incredibly mixed and as a result the ambulance service will be taking its own advice and will be prepared for all conditions. Alongside our ambulances, we will be deploying a number of 4×4 vehicles which will help staff gain access to people who may become injured in any difficult locations during the event. As well as the weather, there are a number of other factors WMAS is urging all festival-goers to take into account, as Assistant Chief Ambulance Officer Steve Wheaton explained. “First and foremost we want everyone to have a great time and enjoy the music safely. “In order to do so, it is important to look after each other, make sure you stick together and that you know where your friends are at all times. “Also, if you are just attending for the day, make sure you have planned your journey home beforehand and only use licensed taxis if that is the option you go for. “It is also important to pace yourself to make sure you can remember what a good time you had when you wake up in the morning. Too often we see examples of people overdoing it on the first night and sadly having to go home early. “Have a drink by all means, but make sure you keep yourself hydrated, and whilst doing so, why not keep an eye on your friends as well? Wednesday 17th August 2016 – 12.40pm – Jamie Arrowsmith. A man has been airlifted to hospital following a three-car collision on the M54 this morning in one of two incidents to happen in a short space of time on the motorway. At 10am, West Midlands Ambulance Service was called to junction six on the Westbound carriageway. Three ambulances, a paramedic area support officer and the Midlands Air Ambulance from Cosford were sent to the scene. A West Midlands Ambulance Service spokesman said: “Crews arrived to find three cars that had been in collision and eight patients. “Two of the patients were trapped in one of the cars and had to be cut free through the roof with the help of the fire service. “From that car, a man believed to be in his 70s was suffering a slightly reduced level of consciousness and was treated for a head injury. “He was immobilised and transported to the air ambulance, which had landed on the carriageway, before being flown to Royal Shrewsbury Hospital. “A woman, also thought to be in her 70s, was treated for a suspected fractured wrist and chest pain, given pain relief and immobilised before being taken to the same hospital by land ambulance. “There were another five patients in a second car, two adults and three children. “Thankfully none of them suffered serious injuries and they were all discharged on scene. The incident followed on from another call to a single vehicle collision involving a motorbike on the Eastbound carriageway which came in at 9.45am. Two ambulances, a paramedic area support officer, a paramedic officer and a doctor attended the scene between junctions three and two on the eastbound carriageway. An off duty paramedic also stopped to offer assistance. A West Midlands Ambulance Service spokesman said: “On arrival, crews discovered a man and woman, both thought to be in their 50s, lying in the road with their motorbike next to them. Wednesday 17th August 2016 – 10.20am – Jamie Arrowsmith. A woman has been airlifted to one of the region’s major trauma centres following a collision between a motorbike and a car this morning. West Midlands Ambulance Service was called to Baneberry Drive in Featherstone at 7.55am and sent an ambulance, a paramedic area support officer and the Midlands Air Ambulance from Cosford to the scene. A West Midlands Ambulance Service spokesman said: “Crews arrived to find a woman lying next to her motorbike on a grass verge and a car with significant damage to its side. “The woman, who is believed to be in her 30s, remained fully conscious throughout and was treated for a serious leg injury and cuts to her arm. “She was given pain relief at the scene and carefully moved on to the awaiting air ambulance, which had landed in a nearby field, before being airlifted to Royal Stoke University Hospital. Tuesday 16th August 2016 – 3.40pm – Claire Brown. A collision involving a pedestrian and a lorry in Bilston this afternoon left an elderly man injured. The incident happened at the junction of Tunnel Street and Avenue Road in Bilston shortly before 1.00pm (Wednesday). An ambulance, two paramedic area support officers and the Midlands Air Ambulance from Cosford with a MERIT trauma doctor on board attended the scene. A West Midlands Ambulance Service spokeswoman said: “When ambulance staff arrived the man was still lying underneath the lorry but thankfully wasn’t trapped and was fully conscious and breathing. Upon assessment it was clear to them that the man, believed to be in his 70s, had sustained a nasty injury to one foot, cuts and bruises to his other foot and a cut to his ear after reportedly being clipped by the lorry. Tuesday 16th August 2016 – 2.30pm – Murray MacGregor. A crash that led to a dramatic fire has closed a busy dual carriageway and left one man needing hospital treatment. The A449 from Blackpole to the M5 around the east side of Worcester was closed after a collision between two HGVs shortly before 11.30am this morning (Tuesday). 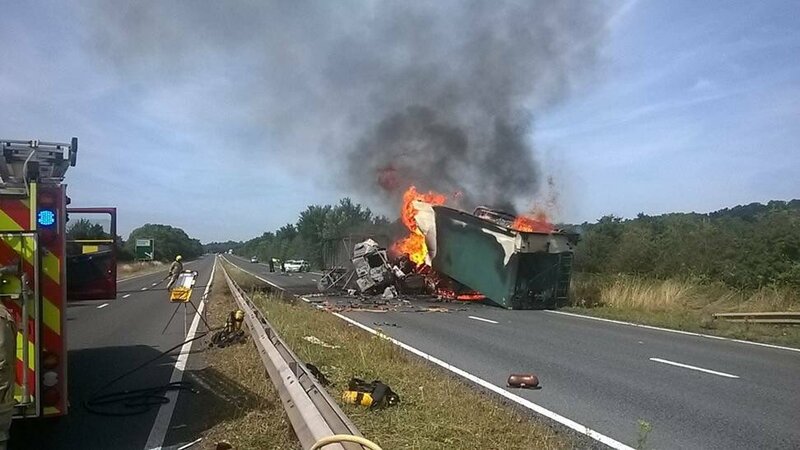 A West Midlands Ambulance Service spokesman said: “The collision caused a fire that has totally consumed one of the lorries, which was carrying wood chips. “The driver of that lorry, a man, suffered chest injuries from the seatbelt and steering wheel and was conveyed to Worcestershire Royal Hospital. The other driver was uninjured and was able to decouple the cab from the trailer before the fire took hold. “The A449 remains completely closed in both directions could remain so for several hours – an estimated re-opening time is 5.00pm. Tuesday 16th August 2016 – 10.15am – Claire Brown. The pilot of a microlight which came down in Worcestershire last night received trauma care by ambulance staff. West Midlands Ambulance Service received multiple 999 calls to reports of a microlight which had crash landed in a field off Holy Cross Lane between Clent and Belbroughton, Worcestershire at around 7.45pm last night (Monday). The Trust mobilised the Midlands Air Ambulance from Strensham, an ambulance, a MERIT trauma doctor, a paramedic area support officer and Hazardous Area Response Team to the scene. The fire service were also responded to the incident. A West Midlands Ambulance Service spokeswoman said: “Upon arrival ambulance staff found a microlight which had made an emergency landing in a field. The pilot and solo occupant, a man in his 40s, was out of the aircraft. Ambulance staff assessed the man and found he had sustained a serious leg injury and chest pain. He was given trauma care by medics including pain relief before being fully immobilised. Monday 15th August 2016 – 5.42pm – Murray MacGregor. A young boy has suffered critical injuries after a collision with a bus. It happened outside the Police Station on Wilton Road in the Erdington area of Birmingham at just before 3.10pm on Monday afternoon. An ambulance was on scene in six minutes and was backed up by a paramedic area support officer and the Midlands Air Ambulance from Cosford with the MERIT Trauma doctor on board. A West Midlands Ambulance Service spokesman said: “When crews arrived, the child had been pulled from under the bus. “The youngster had suffered very serious injuries. “He was taken by land ambulance on blue lights to Birmingham Children’s Hospital with the doctor and ambulance crew treating him en-route. Friday 12th August 2016 – 12.15pm – Claire Brown. A world class touring classical ballet company in Birmingham is dancing for joy after receiving not one but two defibrillators thanks to West Midlands Ambulance Service. The Trust recently donated two automated external defibrillators to Birmingham Royal Ballet to help restart the heart of someone in cardiac arrest. Andy Jeynes, the Trust’s Community Response Manager, said: “Birmingham Royal Ballet is a huge organisation and, as well as its main building in Thorp Street, it has a separate storage facility and when the company is on tour there are naturally a lot of people involved. Last year I helped the company purchase its first defibrillator following some life-saving training we delivered to staff. Thanks to Birmingham International Airport, who recently returned two defibrillators to the ambulance service, I decided to donate the re-commissioned devices to Birmingham Royal Ballet, so that it now have a device at each of its locations as well an additional device to take on tour. Sam Howe, Human Resources Assistant from Birmingham Royal Ballet, said: “We’ve worked in partnership with West Midlands Ambulance Service for many years to promote first-aid training and awareness in the workplace. Last year, they provided advanced first aid training to our staff where it was identified that the company would benefit from additional defibrillator units for the safety of its staff and dancers. The training we received was fantastic. The ongoing support we’ve had from the ambulance service has been second to none and we’re very grateful to them for our two new defibrillators. Friday 12th August 2016 – 8.50am – Murray MacGregor. A young girl has been taken to hospital with dozens of wasps stings after slipping on leaves and disturbing a nest. The unfortunate incident happened in woods near Upper Cotton in the Staffordshire Moorlands at a little before 4.00pm on Thursday afternoon. An ambulance was initially sent along with the Derbyshire Leicestershire and Rutland Air Ambulance with a doctor on board. A West Midlands Ambulance Service spokesman said: “The 6 year old girl was extremely brave considering she pretty distressed having suffered between 30 and 40 stings. “She had pain and swelling over much of her body, but thankfully there had been no allergic reaction that had caused any issues with her airway. Thursday 11th August 2016 – 10.20am – Murray MacGregor. A woman pedestrian suffered multiple injuries after a collision with a bicycle. It happened in Hill Street, Birmingham at about 5.05pm on Wednesday afternoon. Two ambulances were sent to the scene. An off duty doctor who was passing also stopped and assisted ambulance staff. A West Midlands Ambulance Service spokesman said: “The woman, who was in her 50s had suffered a serious head injury along with possible back and pelvic injuries. “She was immobilised before being taken on blue lights to the major trauma centre at the Queen Elizabeth Hospital Birmingham. Thursday 11th August 2016 – 9.10am – Murray MacGregor. A man has been taken to a major trauma centre after the car he was in crashed into trees. It happened at about 5.30am on Thursday morning on Stream Road in Kingswinford, between the junctions of Bromley Lane and Lesley Drive. 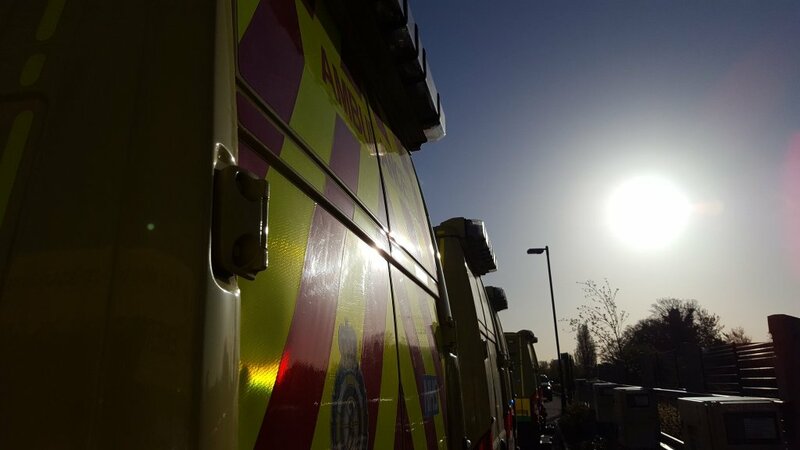 A rapid response vehicle was on scene within six minutes of the 999 call and was backed up by two ambulances, a paramedic area support officer and the MERIT team. A West Midlands Ambulance Service spokesman said: “On arrival, crews found a blue car on its roof with considerable damage. There was a single occupant in the car. The man was trapped for about 30 minutes while firefighters worked with ambulance staff to free him. Wednesday 10th August 2016 – 10.20am – Claire Brown. A motorcyclist involved in a collision with a car received speedy trauma care after the incident was spotted by a passing ambulance crew. An ambulance crew came across the collision at the junction of the A51 and Tolldish Lane, Great Haywood in Stafford at around 4.15pm yesterday (Tuesday). The crew called the Trust’s control room and requested assistance from a paramedic area support officer and the Midlands Air Ambulance from Tatenhill. A West Midlands Ambulance Service spokeswoman said: “Thankfully for the motorcyclist, the ambulance crew were quickly on hand. The man in his 20s had suffered a nasty lower leg and foot injury in the collision. He was given pain relief before his wounds were dressed and stabilised on scene. “The man was then taken by air ambulance to Royal Stoke University Hospital for further specialist trauma care. Tuesday 9th August 2016 – 4.40pm – Claire Brown. A road traffic collision involving a car and a HGV this afternoon saw one man airlifted and two others requiring hospital treatment. The incident happened on the A38 heading towards Birmingham near Bassetts Pole at around 1.30pm (Tuesday). Two ambulances, three senior paramedic officers and the Warwickshire and Northamptonshire Air Ambulance with a doctor on board were sent to the scene. A West Midlands Ambulance Service spokeswoman said: “Upon arrival ambulance staff found a HGV and a car which had been involved in a collision. The car, which had ended up further down the carriageway against the central reservation barrier, sustained serious damage. An off duty doctor was on scene providing initial medical care to the patients. The rear seat passenger of the car, a man in his 20s, had managed to crawl out of the rear window before emergency services arrived and was found on the grass verge. Upon assessment, ambulance staff found the man with abdominal pain. He was given trauma care before being immobilised and carried to the awaiting air ambulance, which had landed on the carriageway, before being airlifted to University Hospital Coventry and Warwickshire for further trauma care. “The driver of the car, a man in his 50s, sustained a suspected fractured arm and neck tenderness. Ambulance staff administered treatment to the man whilst the fire service worked to extricate him from the wreckage. Once freed, the man was immobilised before being taken to Heartlands Hospital by land ambulance. “The front seat passenger, a 32-year-old man, suffered chest injuries. He was administered pain relief whilst the fire service worked around the team of ambulance staff to release him from the car. The man was then taken by land ambulance to Good Hope Hospital. Tuesday 9th August 2016 – 10.10am – Murray MacGregor. 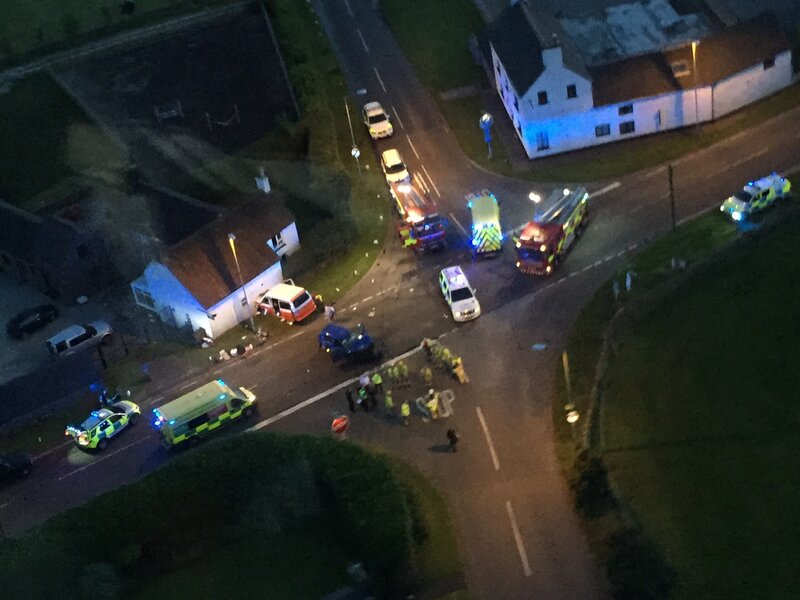 A motorcyclist who suffered multiple injuries after a collision with a car has been taken to a major trauma centre. The crash happened on Mellowdew Road in Coventry at about 4.40pm on Monday afternoon. Two ambulances, a paramedic area support officer and a doctor from the Warwickshire and Northamptonshire Air Ambulance responding in a car, were sent to the scene. A West Midlands Ambulance Service spokesman said: “When crews arrived, they found the motorbike rider in a semi-conscious state. “He had suffered multiple injuries. He was assessed and treated by ambulance staff and the doctor. The man was anaesthetised at the scene before being taken on blue lights to the major trauma centre at University Hospital Coventry & Warwickshire with the doctor travelling on the ambulance. Tuesday 9th August 2016 – 9.50am – Murray MacGregor. An elderly woman has died after a crash between a private non-emergency ambulance and a car. It happened on the A49 in Shropshire at the turn for Strefford at just after 7.00pm on Monday evening. Three ambulances and a paramedic area support officer were sent to the scene. A West Midlands Ambulance Service spokesman said: “When crews arrived they found a non-emergency ambulance operated by MSL had been involved in a collision with a Ford Fiesta. Both had suffered considerable damage. “The private ambulance was carrying an elderly lady at the time of the crash. She suffered serious injuries. After initial assessment and treatment, she was taken on blue lights to Royal Shrewsbury Hospital but sadly died shortly after arrival. “The driver of the ambulance a man estimated to be in his 50s suffered chest pain. The attendant in the back of the ambulance, who was also estimated to be in her 50s, had leg and shoulder injuries. Both were taken to the same hospital. “There were three people in the Fiesta, all in their late teens or early 20s. The 19 year old driver had a slightly reduced level of consciousness and back pain. He was immobilised before also being taken to hospital in Shrewsbury. Monday 8th August 2016 – 5.27pm – Murray MacGregor. A man cutting the grass has been airlifted to hospital after being trapped for about half an hour underneath a ride on mower that had rolled down an embankment. The alarm was raised at about 2.35pm after the man was found at Titley Station, to the south of the village of Titley in Herefordshire. An ambulance, a paramedic area support officer and the Midlands Air Ambulance from Strensham were initially sent to the scene. A West Midlands Ambulance Service spokesman said: “It’s believed that the mower had rolled over at least once as it went down the embankment, where it ended up on top of the man’s legs. “Unfortunately, he wasn’t able to free himself and was trapped for about 30 minutes at the bottom of the 15 foot embankment. “After assessing the man, who was in his 50s, the crews requested a doctor and so the Midlands Air Ambulance from Cosford was also despatched to the scene. Ambulance staff feared that being trapped for so long could have led to complications. Monday 8th August 2016 – 4.21pm – Murray MacGregor. A motorcyclist has died after a crash on a rural road. It happened at about 6.50pm on Sunday evening on the A423 between Southam and Ladbroke in south Warwickshire. An ambulance, a paramedic area support officer, a doctor from Warwickshire and Northamptonshire Air Ambulance responding in a car and the Midlands Air Ambulance from Strensham were sent to the scene. Thursday 4th August 2016 – 4.15pm – Jamie Arrowsmith. A man has been taken to hospital after receiving advanced life support at the side of a road this afternoon. West Midlands Ambulance Service was called to Money Lane in Chadwich, Bromsgrove, shortly before 12.45pm and sent two ambulances, a paramedic officer and the Midlands Air Ambulance from Cosford to the scene. 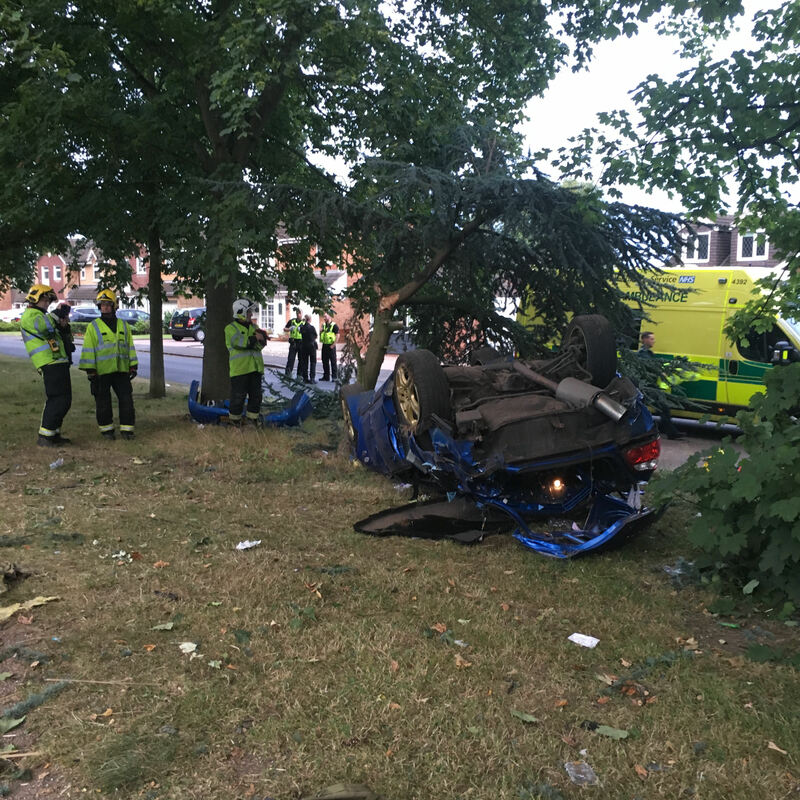 A West Midlands Ambulance Service spokesman said: “On arrival, crews discovered a car that had come to rest against a tree and the driver, a man, in cardiac arrest. “The man, who had been taken out of the car by bystanders, received CPR and advanced life support from ambulance staff before being moved on to a land ambulance. “The air crew travelled with the patient to help continue treatment en-route to Queen Elizabeth Hospital, Birmingham, during which time they managed to successfully restart his heart. Thursday 4th August 2016 – 1.15pm – Jamie Arrowsmith. A woman who had to be cut free through the roof of her car was one of two patients in a two car RTC this morning. West Midlands Ambulance Service was called to Stafford Road in Lawnhead, near to Lawnhead Farm, shortly after 7.20am and sent two ambulances, a paramedic area support officer, a BASICS doctor and the Midlands Air Ambulance from Cosford to the scene. A West Midlands Ambulance Service spokesman said: “Crews arrived to find two cars with front end damage, one of which had come to rest in a ditch. “The driver of that car, a woman believed to be in her 20s, was assessed by ambulance staff for a back injury. “Due to the nature of her injuries she had to be cut free from the car, eventually being freed through the roof. “She was immobilised and given pain relief by crews before being taken to Royal Stoke University Hospital by land ambulance. “The driver of the second car, a man thought to be in his 50s, was treated for a chest and knee injury and taken to the same hospital. Thursday 4th August 2016 – 12.15pm – Jamie Arrowsmith. A motorcyclist has been airlifted to hospital following a collision with a lorry this morning. However, her decision to wear the correct protective equipment has almost certainly saved her from more serious injuries. West Midlands Ambulance Service was called to the junction of the A41 and A529 in Hinstock, shortly before 8.35am and sent an ambulance, a paramedic area support officer and the Midlands Air Ambulance from Staffordshire to the scene. 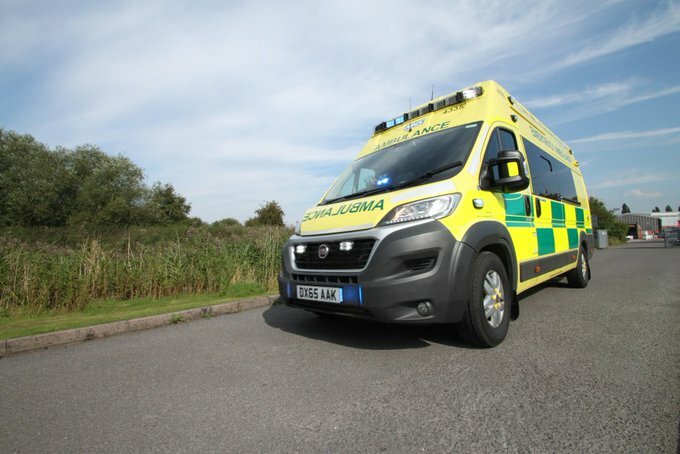 A West Midlands Ambulance Service spokesman said: “On arrival, crews discovered a woman lying on a grass verge next to her motorbike following a collision with a lorry. “She had come to rest approximately 100 feet from the lorry and undoubtedly received significant protection from the protective equipment she was wearing. “The woman, believed to be in her 20s, was treated for a left leg fracture, immobilised and given pain relief on scene before being moved on to the air ambulance and flown to Royal Stoke University Hospital. “The lorry driver, a man, was uninjured in the incident. “West Midlands Ambulance Service urges all motorcyclists to wear full leathers and a helmet every time you go out on your bike, whether you are just popping to the shops or heading out on a longer journey. Thursday 4th August 2016 – 9.00am – Jamie Arrowsmith. A two-car collision outside the entrance to West Midlands Safari Park last night (Wednesday) resulted in seven patients needing assistance from ambulance staff. West Midlands Ambulance Service was called to the A456 Kidderminster Road in Bewdley, shortly before 7.55pm and sent two ambulances, a paramedic area support officer, a medical first responder and a community first responder to the scene. An off duty paramedic also stopped to offer assistance. A West Midlands Ambulance Service spokesman said: “On arrival at the scene, crews discovered seven patients, but thankfully none of them appeared to be seriously injured. “All of the patients were breathing and conscious and ambulance staff quickly began assessing them for their injuries. “One man was treated for arm and chest injuries and given pain relief at the scene whilst a woman had suffered minor leg injuries. “They were both transported to Worcester Royal Hospital on the same ambulance. “Two further patients suffered minor seat belt injuries and were taken to Kidderminster Minor Injuries Unit on the same ambulance. Wednesday 3rd August 2016 – 5.30pm – Claire Brown. A collision involving a car and a van has left an elderly man seriously injured in Stafford this afternoon. West Midlands Ambulance Service was called to the A51 in Pasturefields shortly after 1.30pm (Wednesday). Two ambulances and the Midlands Air Ambulance from Cosford with two trauma doctors and a critical care paramedic on board were sent to the scene. A West Midlands Ambulance Service spokeswoman said: “Upon arrival ambulance staff found a van on its side and a car in a hedge. The passenger of the car, a man believed to be in his 70s, sustained multiple serious injuries and required advanced trauma care by ambulance staff and the doctors. They worked closely with the fire service who carefully extricated him from the wreckage which took 45 minutes. Once released, the man was fully immobilised before being taken by land ambulance on blue lights to Royal Stoke University Hospital; the doctors travelled in the ambulance to provide further treatment en route. His condition was said to be serious. “The driver of the car, an elderly woman, sustained relatively minor injuries. She was treated on scene before being taken to the same hospital for further checks. Wednesday 3rd August 2016 – 9.00am – Claire Brown. 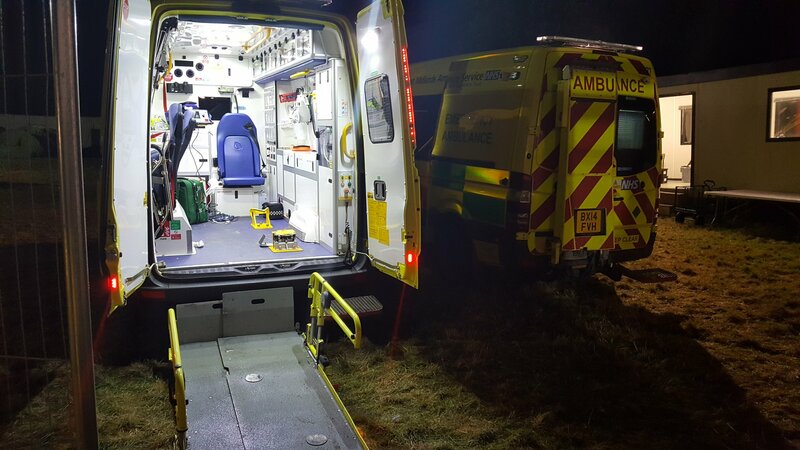 It was a joint rescue effort between the ambulance and fire service last night after a cyclist injured himself whilst out riding with his friends on the Malvern Hills in Worcestershire. 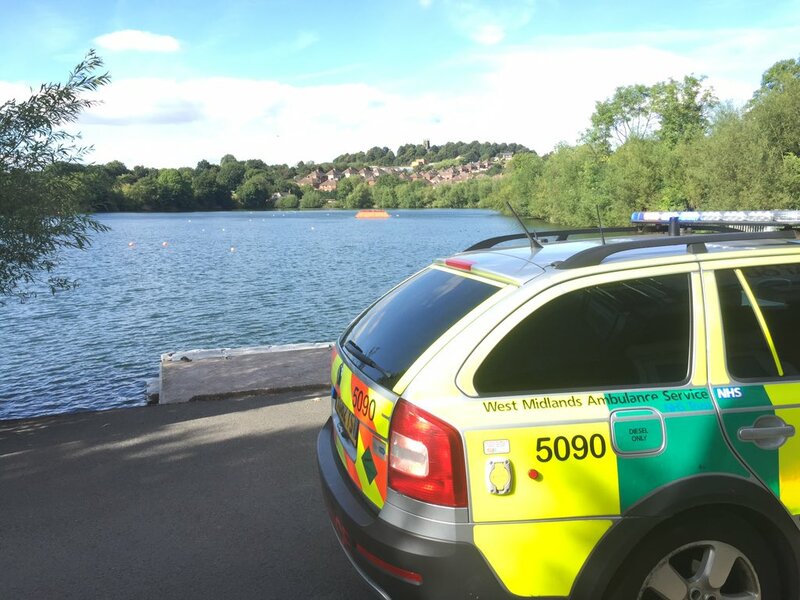 West Midlands Ambulance Service received a 999 call just before 7.30pm to reports of a cyclist who had fallen off his bike and sustained a leg injury. Due to the difficult location of the patient, ambulance staff were directed to meet a friend of the cyclist on Jubilee Drive near to Malvern Hills Hotel. An ambulance, a responder paramedic, the Midlands Air Ambulance from Strensham and the Trust’s Hazardous Area Response Team (HART) were sent. Hereford and Worcester Fire and Rescue Service were also requested to attend. A West Midlands Ambulance Service spokeswoman said: “Crews arrived and were met by the injured man’s friend who then directed them to the patient located on the hillside, approximately 15 minutes’ walk away from the road. The air ambulance landed as close to the patient as possible on the hillside but, due to a lack of a suitable clearing to safely land, the air crew also ended up walking a distance to reach the patient. “Once with the cyclist, a man in his 30s, it was obvious to ambulance staff that he had sustained a fractured ankle. He was given pain relief to help ease his discomfort before his leg was immobilised. Once stable, the cyclist was safely bought down from the hillside along narrow steep paths using the fire service’s all-terrain vehicle. 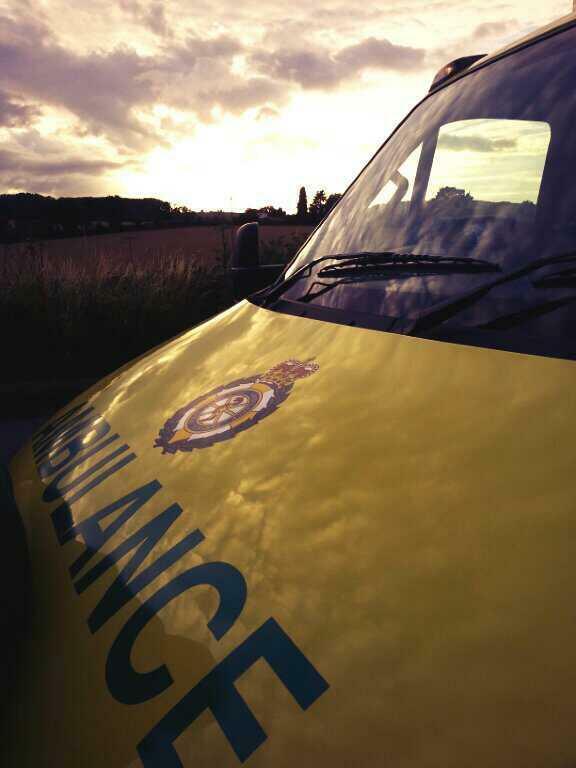 The awaiting land ambulance then took the man to Worcestershire Royal Hospital for further trauma care. Tuesday 2nd August 2016 – 3pm – Jamie Arrowsmith. A car driver was trapped in his vehicle for almost 50 minutes this afternoon following a collision with a lorry. West Midlands Ambulance Service was called to Cole Hall Lane in Shard End, Birmingham, shortly after 1.05pm and sent an ambulance, a paramedic area support officer and the Midlands Air Ambulance crew from Cosford in rapid response vehicle to the scene. A West Midlands Ambulance Service spokesman said: “The man, believed to be in his 60s, was receiving care from an off duty nurse when crews arrived at the scene. “Ambulance staff assessed him and worked alongside the fire service to help rescue the man from the car, which resulted in the driver’s door having to be cut away. “He was treated for chest and pelvic injuries and a significant leg injury. He was immobilised with the use of a pelvic binder, leg splint and scoop stretcher as well as having pain relief administered. 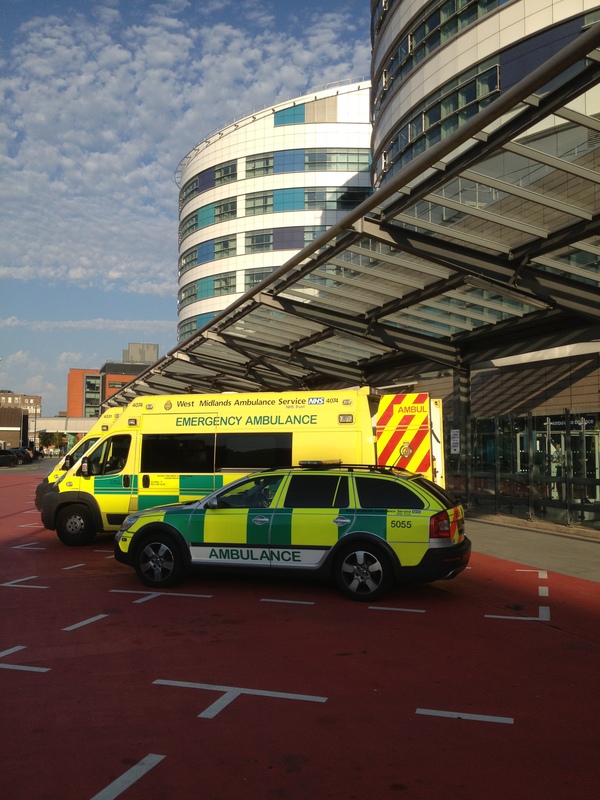 “Crews then transported the man to Queen Elizabeth Hospital, Birmingham for further assessment. Tuesday 2nd August 2016 – 11.20am – Jamie Arrowsmith. A car driver has suffered fatal injuries after his car collided with a tree and overturned last night. West Midlands Ambulance Service was called to Rugby Road in Lutterworth, near to Lutterworth Golf Club, at 7.15pm and sent an ambulance and a paramedic area support officer to the scene alongside colleagues from East Midlands Ambulance Service. 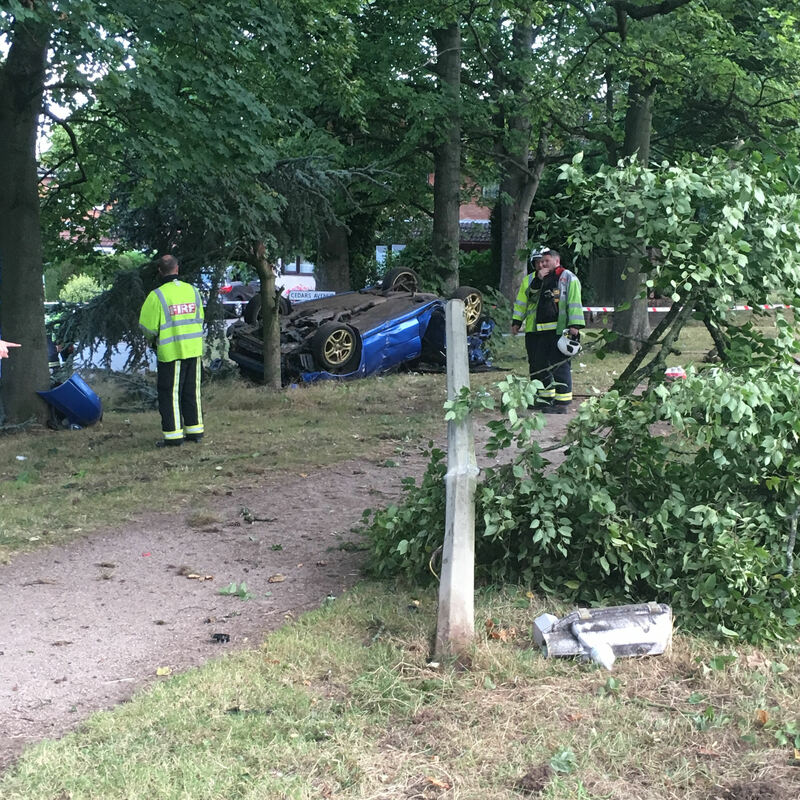 A West Midlands Ambulance Service spokesman said: “On arrival, crews discovered a car which had overturned following a collision with a tree. “The driver of the car, a man, was out of the vehicle and found to be in cardiac arrest. “Bystanders including an off duty nurse had already started CPR which ambulance crews took over. Tuesday 2nd August 2016 – 11am – Jamie Arrowsmith. Two people suffered serious injuries and were left trapped in their car following a collision with a lamppost last night. West Midlands Ambulance Service was called to Dudley Port in Tipton shortly after 11.35pm and sent two ambulances and a community paramedic in a rapid response vehicle to the scene. The Midlands Air Ambulance crew from Cosford also attended in a rapid response vehicle. A West Midlands Ambulance Service spokesman said: “Two patients were left trapped in the car following the collision, having to be cut free by the fire service. “Crews were told the car also collided with a post box after crashing into the lamppost. “The driver, a woman teenager, was treated for a suspected fractured jaw at the scene before being transported to Queen Elizabeth Hospital, Birmingham.